I signed up for the 2017 Manchester Marathon at the same time as I signed up for the Birmingham Marathon for that year, in a frenzy of excitement after completing my first marathon in Reykjavik in August 2016, as soon as Birmingham was announced. Unfortunately, the operation I had to have last year coincided (in its original date) with Manchester and having decided going into surgery three days after running a marathon was not the best prep for recovery, I deferred the place. 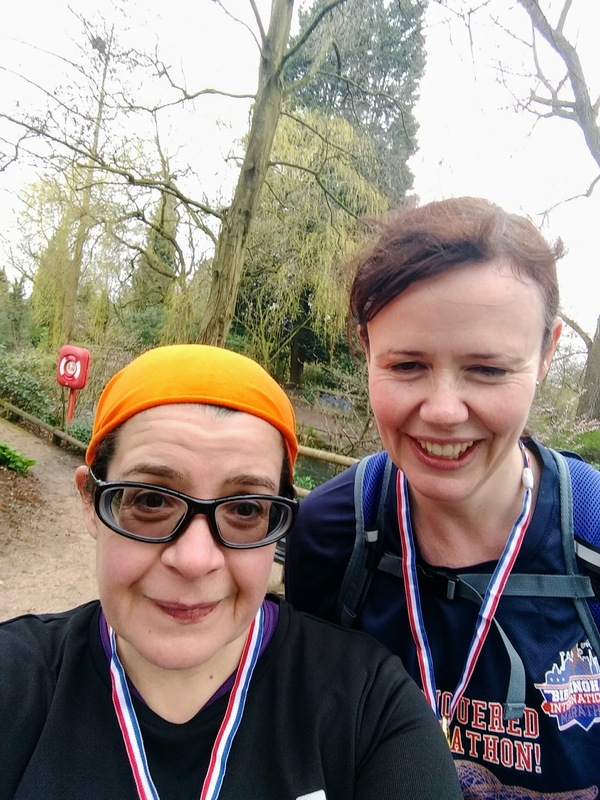 I ran Birmingham in October 2017 (report here) and was hoping to start in on my training almost immediately, keeping things nice and long on the long runs and fit on the rest of things in the six months between the two. I picked up a slight injury running Birmingham (not my fault but the organisation meaning I had to run in the gutter for the last 7 or so miles, avoiding the poor half-marathon runners who were coming through) but some physio from the wonderful Fotios later and I was ready to go. My friend Bernice is doing London next weekend but had a holiday to contend with, so we had a similar schedule. As before, other friends joined us for parts of our long runs, which was really motivational and helpful. The training went really well. I started from a base of 10 miles on 31 December and was ready to build up from there. I was soon doing 20 – 25 – 30 mile weeks with a lower week every four as I try to do. It’s SO much easier doing a subsequent marathon than your first, as you have learned lessons and also you’ve already done all the distances and know how to do your fuelling on long runs so there’s less to worry about. I was able to concentrate on keeping strong and also not coming out of a cracked rib or an operation meant I was starting strong which made a big difference. I was able to do many more tempo runs in the week, where I’d push myself to run faster than normal for longer than normal, got in all my yoga classes and felt so much stronger. Doing a 25-35 mile week most weeks seems optimal for my immune system as Mr Liz got three colds October-February and I had one day of sniffles all that time. We had some super runs, really fun, I felt strong, the pace was decent for even my long runs and I was heading for a PB in Manchester. It wasn’t easy – a lot of snow and ice made me have to move runs or do very tentative slippy runs, and some quite hard officiating duties at cross-country races etc (I’m training to be an Endurance Official) meant I had some quite hard runs tired – although that’s good practice of course and good for the old resilience. I went into the taper feeling so well, much more energetic than the last two marathons. But I’d felt a scratchy throat on the Saturday, enjoyed my 15 miles as part of Bernice’s last long run, and then on the Monday came down with a cold. OK, fine, race day is 8 April, I’m not going to do much running, just one more taper run, I shrug off colds quickly, I’ll be fine. The cold dragged on. It never went to my chest but stuck in my throat – I had laryngitis for a few days with no voice at all. I was so tired and couldn’t run without coughing. I took vitamins, flu pills, fruit juice, ate well, stayed in and warm and it would not shift. The week before race day I could not decide what to do. The Saturday, when we were due to go up to Manchester I realised I had a good chance of not finishing if I started. I would hate to do that when I could have made an informed decision. And being a marshal and official I would hate to use up their time when there might be someone with a sudden problem to look after (I am only considering my own decision here, I don’t have anything to say about people who might have run feeling like this, that’s up to them). So I pulled out of the race and race day saw me sat sadly on the sofa watching my friends run round on the tracker app. Oh dear! However, I had a nosebleed (turns out you shouldn’t use those nasal sprays TOOO much) at the exact time I would have started, and there’s no way I could have run a marathon that day, even though I was feeling well enough for normal life, so I had made the right decision. Forming in the back of my mind, though, as I looked for other marathons and discovered they were on days I couldn’t do or had cut-offs I couldn’t manage, was to not waste the training. Could I do an unofficial marathon the next weekend, around the local area, with a few friends to accompany me? So Sam and I started at 8am in Kings Heath. Dave Johnson was first to join us at Acocks Green bus garage and we were quite fresh then. Stechford Baths saw Jenny Louise Boylan Drew join us thanks to finding us in the car, and we set off again. I used the loo in a tile place because needs must when marathoning, I had some stomach pains first half of the run but nothing too bad. We ran to Erdington along the 11 bus route, including my favourite under the M6 bit. Jenny left us after the second M6 bit, massive thanks to the Boy for the cheering on. We slogged on through, we got lost at one point somehow but spotted Dave across a car park. Tracie Clive beeped us several times and leapt out of a hedge to say hello! Yay! Another break at Stechford then Trudie Marie and Grace Garner were at Tesco Swan, hooray! 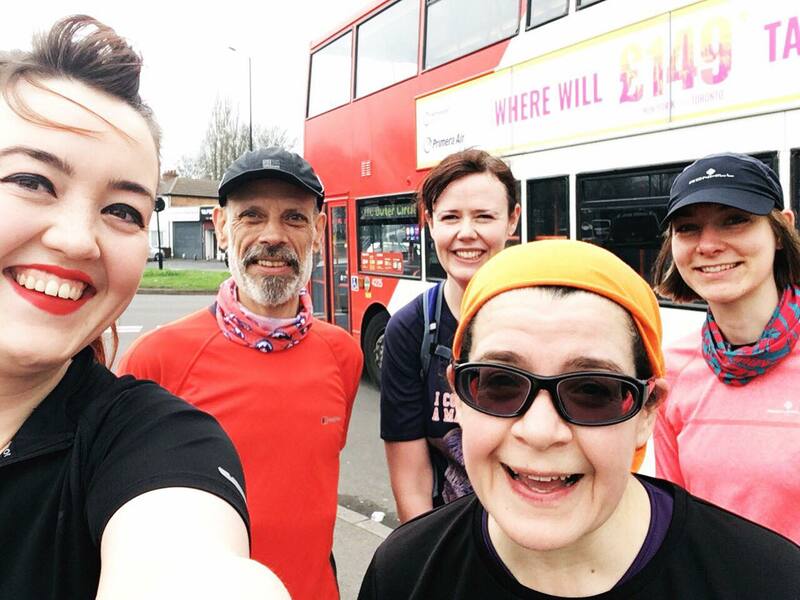 Grace did Manchester the weekend before and ended up doing 16.6 miles, however many of them a lot slower than her normal pace. Getting slower and more painful but we pushed on up the hills. Goodbye to Dave at Acocks Green, a wonderful 13.3 with us and we were very grateful. He also helped us to “collect” sightings of furniture which was our inadvertent theme of the day. We carried on, ooooh it hurt. 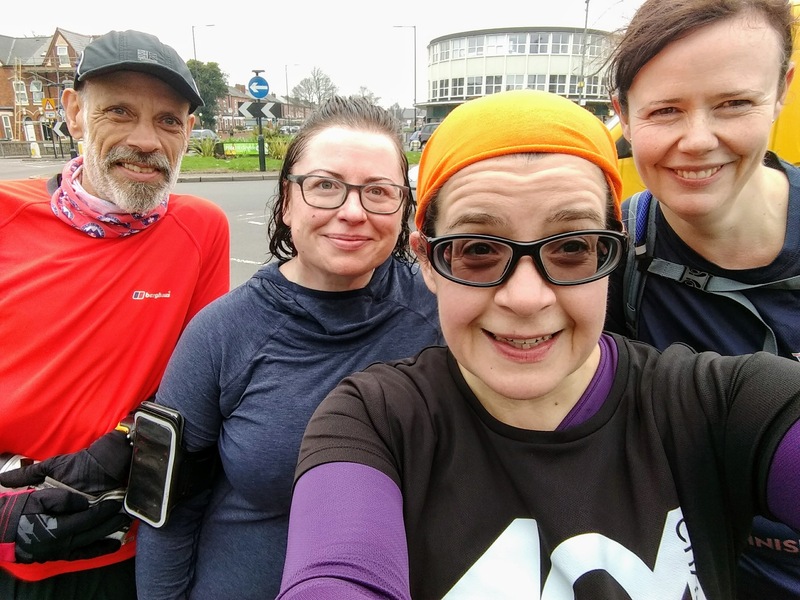 A break at my house to collect drinks, have a bite of a banana and a fresh hanky then loop and loop around Kings Heath, just following Trudie and Grace who both saw us to the end, epically, even though they had to run further than they’d intended. We went into the local park for the last 1.4 miles, my watch had failed at mile 19.47 but we’d done a SUM (wrong) and we knew how much we had to do on Trudie’s watch. A bit of Jeffing (walking and running) but not too much, some sobs here and there – after all both Sam and I missed Manchester with a cold virus so we weren’t completely better, and had not run much. Round the park, through the pond area, Trudie cheering us on, Grace sweeping us up, and we were DONE and Trudie had medals for us. her husband Dave kindly gave me a lift home. Training NOT wasted. I had to add Trudie’s file to mine but we definitely did 26.3 miles. WHEEE! A real team effort. Next marathons are easier than the first one. It’s easier to go into marathon training having some miles in the legs and fitness. Long-distance runners are bloomin’ resilient. I need to carry on doing marathons. I’m not done with them yet. Well done! Even if i t wasn’t ‘official’ it was a marathon, it was damn impressive and you didn’t waste the training. Result!!! Thank you! In some ways it was less stressful than a race would have been. Oh my goodness, how upsetting for you! I have never lost a toenail running, I had one go a bit odd once and panicked but it was OK. Yes, it was a good option for using the training. I’m not sure I’d have been able to build up to running just a marathon around the streets without having done the training for an official one and not wanted to waste it, but then again it was fine doing the distance around and about. Let me know if you do do it! Oh gosh of course not! I’m not sure how much you’re running now even, and never impose expectations on people – but do get in touch if you need any advice! When looking at new trainers, make sure you have at least 1cm between the end of your toes and the toe of the shoe, and that your toes have wiggle room sideways, too. Good luck! Thank you Liz you are very kind. 😀 one thing I have read in the past is to wear two pairs of socks. I think the idea is that the socks rub against each other rather than your skin! Have you come across anything like this? I have, but I haven’t done it, and that is against blisters rather than nail loss. I did get a blister on Sunday but have checked the inside of my socks and there was a little nub. Not done yet! That’s what I figured! I have to say I’m having the most inspiring day. I know I said no more marathons for me but after Boston stuff all day and your story, idk…wheels are turning. Aw, thank you! I did feel bad when I thought Oh, you said you might track me. I am signing up for a canalside marathon in August – have to get my calves strong and practise little bridges but there is a loonnnnnnng cut-off, it starts and finishes near home and it has a cake competition! What one are you thinking of doing next? I think you have another in you for sure! Not thinking about another quite yet! Just going to stay in 2018 for now ;). Completely fair enough! I’m going to come and do New York just as soon as anyone who lives in my city is allowed to fly into America, if you get my drift. It’s not only you that has sold it to me, don’t worry! Thank you! It’s the first time that’s hardest in the training, for sure, as there’s all the terrifying working out how to fuel yourself on the go, which can be tricky. I knew all my quirks and how I’d feel etc. second and third times around (e.g. I’m really hungry after an up to 14 mile run, not so much after going longer, so fine). Thank you for acknowledging the time spent in training, though – esp if you’re a slower runner like me! The most important thing is that I enjoy it. Yes, indeed. I do not like running on icy surfaces but apart from that I’m happy in cold and wet conditions, so it’s a good all-round activity for me (in fact I dislike running in the sun more, so will have to get in some hot training for my upcoming August marathon!). I love your glasses. Are they transitions? I just went that route myself and game changer! Your make up marathon sounds fun! I love your sightseeing tours around. Yes, they’re Reactolites so, um, react to the light levels. Brilliant for running. And they’re varifocal, like all my others, but the optician made the long-distance vision part bigger with just a small close reading bit so I can see my watch, so really safe. It was fun, I have done that route before, although not as far. 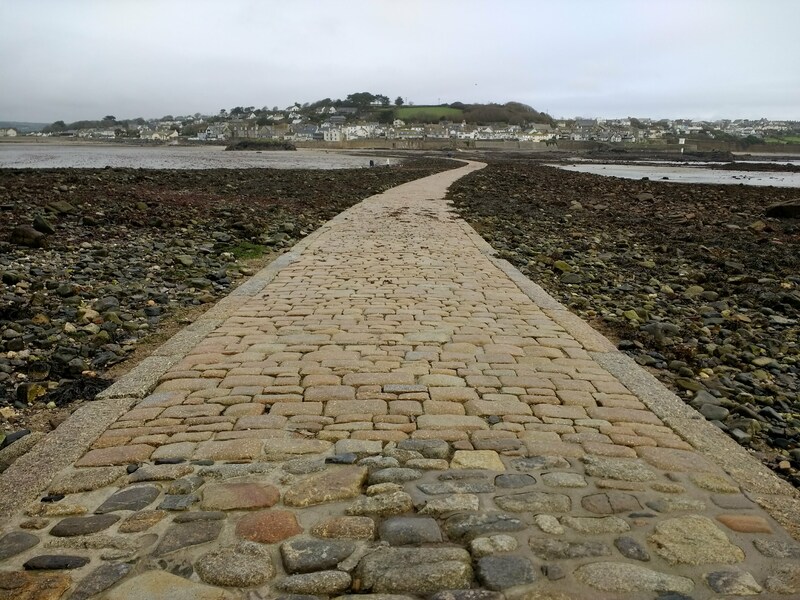 Next plan with that route is to go all the way round – handily 26 miles! Don’t fret about missing the postponement – I didn’t talk about my op on here until way afterwards and then not in detail, so you didn’t miss anything! I healed well from that, running a month after and doing Birmingham, and then Fotios the Magic Physio sorted out my back/leg spasm after Birmingham so it had minimal impact on this training. I would LOVE to do NYC, it looks fab, I know a few people who have done it. I’ve not even been to DC, either, so that’s a nice idea, thank you. I have quite a few friends who have done Berlin but have never quite fancied it or Paris for some reason. Not sure why! Let’s hope I can visit America some time soon! I’d also like to do Chicago (and have a friend there, too!) and Toronto, which I could obviously do from now anyway. I think we ran “together” in the end on Sunday by the way as you were out doing your thing too and the times overlapped. Hooray! Transatlantic synchronized running for the win! Not being able to read my watch in between miles (when the pace takes over full screen) is a thing. My one pair of bifocals (failed experiment, went back to separate readers) are ill suited to running so if there’s flexible spending funds remaining I might get a pair of cheap plastic ones that can take clip ons for running. I never considered transitions before running and they’re game changer — also love n ot having to hunt down sunglasses before I go on vacation. Paris as a city doesn’t appeal. I love Berlin. Toronto is a fun city if you haven’t been. Yes. Or races that start before sun up. I ended up running Fort Lauderdale without as I checked my glasses in my gear bag and ran with sunnies, which I never needed. You have, and thank you! It was a bit weird but I seem to have got away with it, though a little fatigued still. Very glad not to have wasted all that training! Oh, I’m so excited that you ran your own race! I’ve never been a distance runner–in my twenties I ran 10Ks, and my very last race was a half marathon, which left me retching. I admire your stamina and training, and think it’s probably better to run your own race than get into that whole running in the gutter thing you described. You look so happy in the photo! Good for you! That’s so funny, I’m completely the opposite way around. I hate running 10ks, I don’t mind halfs but 10ks are my nightmare. I’m slow so everyone’s “Oh look at the poor slow lady” and then I only get going after 5 or 6 miles so then I’m all no I have to stop now?? I can only manage parkrun by running there and back and running round parkrun’s 5k in the middle! But give me a road and 6 hours and I’m a happy bunny! it does take all sorts! Just Wow! What a rollercoaster of emotion that must have been. I can’t imagine having to pull from a marathon so close to race day – you must have been gutted. 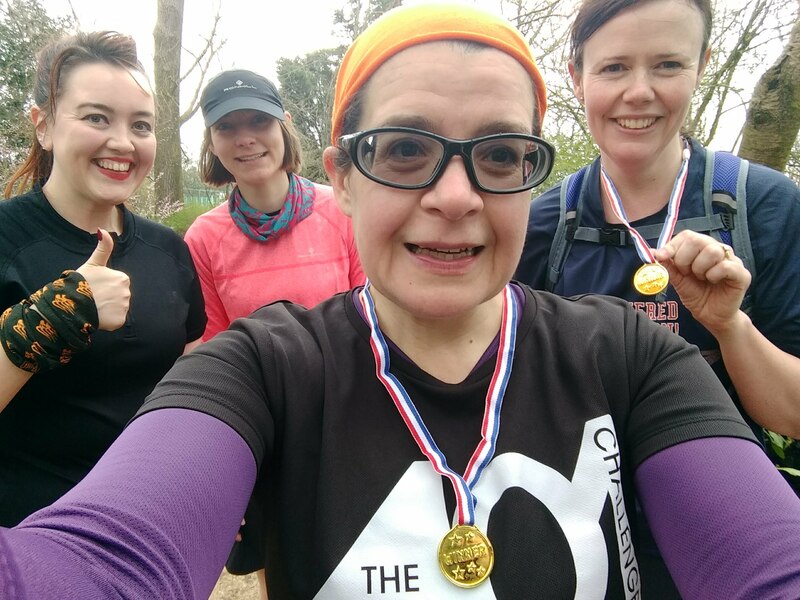 But to make good on all that training with your DIY marathon was a brilliant idea, and how wonderful to get to run sections with your friends. Well done, Liz. Epic job! Thank you! It was easier pulling from my third than it would have been from my first and was a sensible decision. I already have another booked for August of course … and yes couldn’t have done the DIY one without my friends around me! Amazing effort – well done!